So you play guitar, and are in the market for an overdrive pedal to give you that great dirty sound or crunch you’ve been looking for that your amp just can’t give. Or perhaps you’re looking for a pedal that will give you a bit of a clean boost along with a bit of dirt? Some overdrive pedals are perfect for that, too. No matter the case, having a good overdrive pedal in your array of guitar pedals is a must. What are some of the best overdrive pedals for guitarists to use? I’ve done the research and compiled a list of the 10 best overdrive pedals below – check it out! On a budget? Scroll down to #6 to see my list of the best overdrive pedals for under $50! **Note: I have affiliate links to various overdrive pedals through Amazon. If you make a purchase, I will make a small commission, but this is at NO cost to you. If you would like to read more, check out my Disclosure Policy. 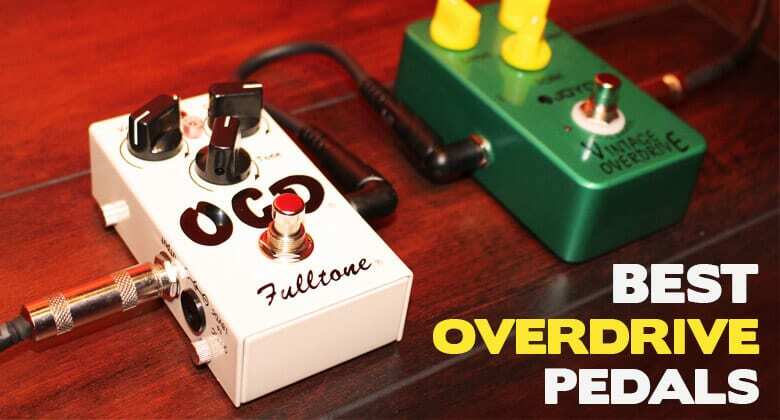 BEST OVERDRIVE PEDAL ON THE MARKET The Fulltone OCD (Obsessive Compulsive Drive) Overdrive Pedal is a pedal you will hear about over and over when researching overdrive pedals. Many forums and sites will say that this is the best overdrive pedal out there (it lists around $115). I AGREE! I own this pedal myself and it sounds amazing through a Fender Blues Jr. amp and a Fender American Deluxe Telecaster guitar. The pedal has 3 controls – volume, drive, and tone. It also has a single switch for LP and HP which is Low Peak and High Peak. The Low Peak (LP) option will give you an untouched tone – basically gives you the tone that your guitar and amp are giving you. The High Peak (HP) option gives you boosted mids, slightly boosted highs, a boost in volume, and slightly more gain. With the drive knob turned all the way down and the volume knob turned up, you can get a nice gritty boost to your cleans. On the other hand, with the drive knob turned all the way up, you can get a thick crunch, with even more gain in the HP setting. The tone control has a great range for making your tone sound dark (turned all the way down) to sounding very bright (turned all the way up). This way, you can make even the darkest sounding amps sound bright, and vice versa. The amount of tonal variations you can get with this pedal makes it worth it. It’s actually labeled as an overdrive/distortion pedal. That’s because in the LP (Low Peak) mode you can get a nice clean boost with the drive turned down or a crunchy overdrive with the drive turned up. However, keep that gain up and flip the switch to HP (High Peak) and all of a sudden you have a Marshall-like distortion screaming out of your amp. It’s wonderful. Needless to say, the Fulltone OCD Overdrive Pedal is, in my opinion, one of the best overdrive pedals on the market, and would be a great choice for anyone looking to add an overdrive pedal to their array. I also like that it’s a simple one-button, compact pedal which helps not take up so much space on a pedal board. THE CLASSIC OVERDRIVE PEDAL The Ibanez Tube Screamer is a legendary overdrive pedal that has been extremely popular since the original TS808 Tube Screamer pedal was released in the late 1970s. This is the classic overdrive pedal. If you ever have a conversation to anyone about overdrive pedals, I guarantee this pedal will come up almost every time. The pedal has a mid-boosted tone that is popular especially with blues players. One of the most notable blues players ever, Stevie Ray Vaughan, used an Ibanez Tube Screamer. Other notable guitarists to have used an Ibanez Tube Screamer are Steve Vai, Carlos Santana, Keith Urban, Kirk Hammett, and many more. Since Ibanez really nailed that classic overdrive tone, the Ibanez Tube Screamer is easily one of the most popular, and most cloned/modded pedals out there on the market. Everyone wants to build their own slightly tweaked version to see who can get the best sound. If you’re looking to have those blues riffs of yours shine, this is the classic blues overdrive pedal to have. Don’t have around $100 to spend? Check out #6 – the Joyo Vintage Overdrive Pedal. It is a clone of the Ibanez Tube Screamer Pedal that is sold at a fraction of the price. I believe it sounds just as good if not better, too. Vintage: Vintage mode acts as your “base” mode. The other two modes (FM and CompCut) are additive. Vintage mode gives you mid-heavy tones that cut through the mix. FM (Flat Mids): The FM settings gives you a more natural, transparent sound. With slightly less gain, this mode would be great to use with a Strat’s neck pickup. CompCut: CompCut takes any kind of clipping out of the circuit which can be used for a great clean boost with a lot of headroom. Also, it gives BIG volume boost. The second switch (farthest to the right) lets you choose between “Standard” and “Mosfet” mode. “Standard” mode is more asymmetrical, more open sounding, and more transparent. In “Mosfet” mode, you get tighter low notes and bit more overdrive. Switching between these modes is a fairly subtle difference, but still gives you that many more tonal options. Take into account the extra boost channel on this pedal and you’ll find it is PACKED with options. It’s tough to explain all tonal variations this pedal provides. The best way would be to just watch the pedal demo and listen for yourself! This pedal by far gives the most amount of sound variations and is very highly rated by many users. You’ll find this pedal high on many lists of the best overdrive pedals out there. 90’s: 90’s mode gives you smooth, symmetrical clipping which shows off the classic overdrive tone from the Full-Drive 2. CompCut: CompCut mode would be like the Full-Drive 2’s CompCut mode. It takes any type of clipping out of the circuit which can be used for a big boost, especially in volume. Wide Asym (Wide Asymmetrical): Wide Asym mode really helps the highs and lows cut through the mix, and gives a chimey, Class-A type of harmonic overtones. The second switch (farthest to the right) lets you choose the order of the overdrive and boost channels. For example, with the switch up in “OD-BOOST” mode, the overdrive comes first, and then the boost. This gives you a volume boost. With the switch down in “BOOST-OD” mode, the boost comes first, then the overdrive. This results in more gain when you enable the boost channel. Lastly, the “Dynamics” control is a Germanium diode limiter which, when turned clockwise, helps take out the irritating spikes that can occur with other clean boosts when you hit the strings hard. To top it off, this pedal casing is 20% smaller than the Full-Drive 2, which is always a plus! This pedal is one of the newest, most versatile, and hottest overdrive pedals on the market right now! The Electro-Harmonix Soul Food Overdrive Pedal is a tasty, transparent boost/overdrive pedal that can produce some great sounds. One nice thing about this pedal is it has boosted power rails which provide higher voltage to the circuit. This will boost your output giving you a boomier bass with a high gain setting or a nice boost to your cleans. Whether you are using this pedal to give you a wonderful sounding clean boost, or turning the gain up to get a smooth, yet crunchy overdrive, this pedal is sure to add value to your array of sounds. Fantastic ratings on Amazon prove that this is a loved pedal by many. I really dig the sound of this pedal. Check out the pedal demo and I think you’ll see what I mean. I plan to add this pedal to my arsenal in the future. I highly suggest watching the comparison video mentioned in the paragraph below to see how this pedal compares to the Ibanez Tube Screamer. BEST BANG FOR YOUR BUCK I can’t say enough good things about the Joyo Vintage Overdrive Pedal for the price point it’s sold at. I own this pedal and can personally say this pedal ROCKS for the money. If you are interested in the Ibanez Tube Screamer and the sound it delivers, this thing will do just that for a fraction of the price. I dare say that I like the sound of this pedal more than the actual Ibanez Tube Screamer. Want proof yourself? Check out this comparison video between the Joyo Vintage Overdrive Pedal and the Ibanez Tube Screamer Pedal. I personally believe the Joyo Vintage Overdrive Pedal sounds better. If you’re looking for that pedal to give you the classic Tube Screamer tone for a much cheaper price, this is the pedal for you. You’ll get a nice clean boost with the drive turned all the way down and the volume boosted. Additionally, turn up the gain and you’ll get that perfect mid-boosted bluesy sound that blues players like Stevie Ray Vaughan used so well. The Boss SD-1 Super Overdrive Pedal is an industry standard overdrive pedal that has been popular for decades since the early 80’s. The nice thing about this pedal is that it’s inexpensive, has a nice overdrive tone, and uses asymmetrical clipping. What does that mean? Well asymmetrical clipping means that the pedal gives the natural overdriven sound of a tube amp cranked up which many people love and desire. Boss pedals have been around for a long time, and many of them are classics. Many large pedal boards will most likely have a Boss pedal on there somewhere as they make TONS of great pedals. If you’re looking for an inexpensive industry standard overdrive pedal made by a long-standing company, this is the pedal for you. The Donner Blues Drive Pedal is a great, tiny little pedal perfect for that bluesy overdrive. If you’re looking for an overdrive pedal that will give you light to medium added gain, this pedal is fantastic for the price. It does not have a ton of gain when the gain is turned all the way up, but hey, if you want a ton of gain, look at distortion pedals! The tiny size of this pedal can also be a major perk for people struggling with space on their pedal boards. The pedal has a large knob for gain, and then two smaller knobs in the upper corners for tone and level along with a switch for both “Hot” and “Warm” tones. All of this packed into a tiny little casing! The TC Electronic MojoMojo Overdrive Pedal is very cool because it offers a LOT of different sound options in a small, compact pedal. With 4 controls and a separate voicing switch all packed into a small pedal, this is a pedal to definitely check out. As far as the 4 controls go, you have your fairly standard drive, level (volume), and treble control (which can basically be translated to a “tone” control). However, on top of those 3 controls, this pedal also provides you with a bass control and a “voice” switch which provides an awesome mid-shift. I think the best part about this pedal is how versatile it is for its size along with the bass control. This bass control alone gives you so much power over your sound. With the bass control all the way down, your sound will be harsher and thin-sounding. But, turn that baby up and all of a sudden you have a nice warm, thick tone that not only brings out the low end, but really helps give thickness and sustain to those higher notes. With 4 full-sized controls and a “voice” switch all packed into a small casing, this overdrive pedal will give you a vast array of cool sounds using a small amount of space on your pedal board. Pretty awesome! The Behringer Vintage Tube Overdrive Pedal is the least expensive pedal in this list. You can usually pick one of these up new for only $20! Not bad. Although it’s not my first choice when it comes to overdrive pedals, if you’re just looking for a cheap overdrive pedal to add to your sounds, you should consider this one. It has your standard three knobs – drive, tone, and level to help shape your sound. People describe this pedal as having a more “vintage tube” sound (hence the name) which indicates it has more of a bluesy, overdriven tube-amp type of sound when enabled. Although the casing is made out of plastic (instead of metal like many of the other pedals I have listed), it’s really hard to complain when it only has a $20 price tag. Try one out! So there you have it – the list of the 10 best overdrive pedals. I own a couple of these, and plan to purchase a couple more in the future to try out because there are just so many good options available when it comes to overdrive pedals. Having an overdrive pedal on your board I believe is a must, and the ones listed really shine! Disappointed you did not pick the Ibanez Original 808 tube Screamer. The newer one has a little harsh top end in comparison. Also no mention of the improved had wired Ibanez Tub Screamer. No mention of the Seymour Duncan 805 either? Has anyone within the last 30 years ever NOT reviewed any of the Tube Screamers – TS-9, 808, etc? Everyone knows how they sound.. It’s nice to have reviews of new and previously unreviewed items. Yeah I love my OCD pedal and the Joyo Vintage is fantastic for the money. Two of the main pedals I currently use! I would consider the Digitech Bad Monkey as well. It is a great “bargain pedal and allows for a good amount of EQ control. Basically a TS style pedal with a bit less transparency and a bit more grit. Thanks for the suggestion! I’ve seen a number of people using that pedal as well. I bought the OCD because of this review! and not because “is the best” on this list, I believe IS the best OD pedal, period! I had the chance to try some of the pedals of this list, and they’re all great, but for my personal taste OCD is the all-around best. The good thing here is that you can have some of them and combine them, using one as a clean boost then you can even go further in the OD space. For my personal taste I would of been adding the BB Preamp, it’s really great. I also love the Pork Loin. Happy 2017! Thanks for the comment, Mac! I absolutely love the OCD pedal I have. In fact, a guy I play guitar with owns 3 OCD pedals and stacks them all next to each other. When he enables the first OCD, it’s a good gritty boost… he enables the second one, awesome lead guitar crunchy tone, enables the third one… face melting status! So is the Soul Food an overdrive or distortion pedal? All the official documentation and sources claim that it’s a distortion pedal but many review sites are categorising it an an overdrive. I own both the OCD and the SF and I struggle to put them in the same class. There is no doubt that the Tube Screamer and OCD are overdrive pedals but I feel that the SF is much more mellow and more like a simple boost distortion pedal than an overdrive pedal. Based on the reviews of the Soul Food that I’ve watched, I think the Soul Food falls more under the “overdrive” category personally. However, if you crank the gain enough, I’m sure it can sound more like a distortion pedal. I think the Soul Food does really well as a simple clean boost or for a slightly gritty tone. the Soul Food is a clone of the Klon Centaur. It’s technically a low-to-mid-gain distortion pedal, but gives a completely transparent (i.e. doesn’t ‘shape’ the tone at all) slightly-gritty clean boost with the gain turned down, so it can function as both depending on the gain setting. It’s the same idea as the Wampler Tumnus, Tone City Bad Horse, and a whole bunch of others. The Centaur – and now its clones – found their most popular use as boost pedals to drive an amp rather than as distortion, which is why the descriptions of them are always a bit muddled. If you are going to recommend Joyo you should mention their Ultimate Drive which is their version of the OCD at a fraction of the cost. Which isn’t true bypass and lacks clarity. But it’s great value for those on a budget, not so much for those that aren’t. Noted! Yeah, some of the cheaper pedals aren’t true bypass. But hey, if you’re on a tight budget and need something that works, they can be great options. Digitech pedals (Bad Monkey, Screaming Blues, Hot Head) are now discontinued and we’re always a ‘marmite’ kinda thing! I bought the last two back in the day and still have them on my pedal board – so definitely on the ‘love it’ side of the marmite equation! Playing my fat strat into a Vox tube amp, the SB offers smooth, tight OD without muddying the tone and the low/high eq knobs provide a really effective onboard means of sculpting your sound. Brilliant pedal – RIP! I’m a bit surprised not to see a mention of the old standby BD1 Blues Driver although I think the OCD does the flatter EQed blues crunch thing as good or even better (I use the OCD for this myself) but the BD1 is still a solid pedal for its purpose. I guess it’s like a earlier comment about the ts808 though, I guess everyone has heard reviews and knows about the BD1. Yes, very true. Thanks for your comment, Tom! I had never chance to play Caline, Mooer and other Chinees brands. Yeah, I definitely agree Muris! Joyo pedals do a fine job for those guitar players on a budget. Thanks for the comment. Well I think you have to compare different types of the OCD. They all have not the same circutry! Best of all is the warmer V2 version. Now they have upgraded the V1.7 but it sounds nearly more gritty. In fact Soul Food and Blues Drive Keeley modded are fantastic! or Mad Professor Twimble which is nearly the King of Tone! Really good article and great pedal selections. I completely agree with the Fulltone OCD being your number one selection, it’s been my go to overdrive pedal for a long time now! Hey Samuel! Yeah, I have loved my Fulltone OCD since I’ve owned it. Thanks for stopping in and keep rockin’! Nice list especially because of the detailed description of each pedal. Have you played the Truetone VSXO premium overdrive? I am so curious about those but haven’t found a convincing demo yet. I own three of your mid/low priced choices here. Plus a couple more but still in the quest of a low/mid rounded voiced overdrive, preferably dual! If you got couple of more suggestions I will appreciate. Hi Ces! I have not been able to play the Truetone VSXO Premium Overdrive yet unfortunately. That’s cool that you own a number of the choices I suggested… they’re all great pedals! I have 3 of the pedals on your list, I agree they are pretty good! Mojomojo, Donner Bluesdriver, and Boss SD-1…I have some others as well, a very old Yamaha OD 10MII and a Berhinger Vintage Tube Monster…all have their good points. Very cool, Stephen! Sounds like you have quite the array of pedals. Keep rockin’! Hey Steve, thanks for the suggestion! I’ll have to go check it out at one of the music stores. … or just a nice and slightly different is the BBE Green Screamer, more transparent & true bypass, with a different sparkle and a bit more gain to it. Sounds like a sick setup! Thanks for the comment, Christian.